How can SA Legion help you? Get help from the South African Legion. Our Branch Office staff are qualified to answer a range of enquiries relating to military pensions, military historical matters, lost medals, etc. and to assist with general welfare enquiries. Our residential complex - Rosedale, an aerial view of which is pictured on this page, offers a wide range of comfortable accommodation. Flats are rented while cottages are sold on a Life Right basis. Conveniently situated in Rosebank in serene surroundings, close to transport, residents receive a meal a day and utilise the Service Centre for activities. 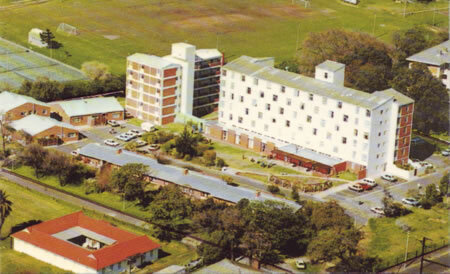 Aerial view of Rosedale, the Cape Town Branch housing complex at Rosebank Cape. The accommodation is not serviced and residents must be able to care for themselves. There is no Frail Care facility but there is always a helping hand to assist with minor ailments and illnesses. You are welcome to view accommodation. To do so please telephone the Residence Manager on 021 689 9771. Application forms are available at the Cape Town Branch office or alternatively, click here to download and print an accommodation application form. The Cape Town Branch of the Legion operates a Service Centre on behalf of the Department of Social Development. It is available to all retired persons of 60 years and over no matter where they live, and those who join the Centre at the minimum charge of R48.00 per annum, are able to take part in a wide range of activities. A midday meal is also available at a very reasonable cost on pre-purchase of meal tickets. Booking of seats is essential. Telephone 021 689 9771 for more information or click here to download the RSC application form. You can also apply online for membership. The Rosedale Service Centre hosts various regular activities for its members such as a weekly church service and prayer group, recreational activities such as darts, snooker and carpet bowls, arts and crafts workshops, card games such as bridge and canasta and exercise classes. Activities such as outings to local places of interest and social evenings are also organized from time to time. Please contact the Rosedale Service Centre office on 021 689 9771 between 0900 and 1130 on weekdays for further information.